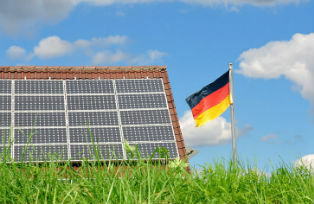 Germany is a world leader in renewable energy deployment. Driven by a long-term renewable energy policy that dates back decades and, more recently, a nuclear power phase-out, the country is spearheading a transition to renewables commonly known as the Energiewende (energy transition). For many years, the policy instrument of choice was a feed-in tariff (FIT). It guaranteed a fixed payment for (in most cases) 20 years and priority grid access for renewables. The policy provided high investment certainty and triggered tremendous growth in renewable power generation capacity. 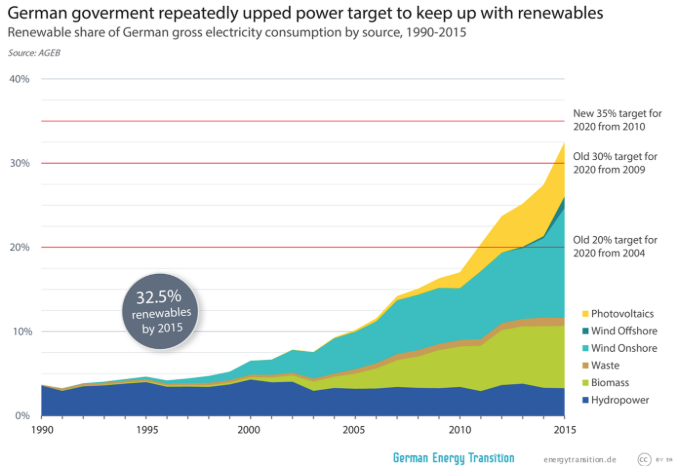 When the initial law was introduced in 1990, the role of renewables in Germany’s power mix was negligible. By 2015, renewable electricity made up 32% of consumption and had grown at speed exceeding all expectations. The government repeatedly had to upgrade its targets to keep up with renewables growth. 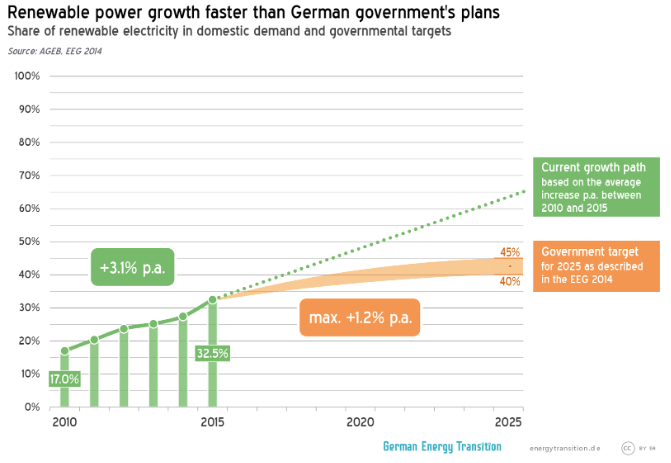 But a couple of weeks ago, the German government put forward plans to overhaul the Energiewende’s flagship policy. The planned reform of the Renewable Energy Sources Act includes a switch from feed-in tariffs to auctions. With the reform, the government reiterates previously set goals to increase the share of renewable electricity to 40-45% in 2025, to 55-60% in 2035 and to at least 80% by 2050. But to keep a steady hand on the rise in renewable power, a “deployment corridor” will set limits on how much renewables capacity may be added per year. These limits are set per technology: For onshore wind, a gross amount of 2,800 megawatts is to be auctioned each year over the next three years (2017, 2018 and 2019), increasing thereafter. For solar, 600 megawatts will be auctioned each year, and the overall corridor of 2,500 megawatts per year will remain (the remainder being built under FITs). For offshore wind, the overall target is 15,000 megawatts by 2030. For biomass, 150 megawatts are annually up for auction in 2017, 2018 and 2019. Small renewables installations like rooftop solar will continue to receive feed-in tariffs (with small changes). The government believes this will ensure that citizen cooperatives and project developers remain active in operating small renewables plants. These limits have been attacked for protecting old coal power plants at the expense of renewables. But the government argues it is making renewables deployment more predictable, thereby facilitating grid expansion and improving planning security for Germany’s neighbours and for the energy industry. After all, Chancellor Merkel promised the Energiewende must not destroy German utilities. Critics argue that the government is putting the brakes on the Energiewende. Green campaigners see the limits for onshore wind power, the most cost-competitive renewable technology, as a sign that the government is trying to slow the rapid growth of renewables. In light of past growth rates, the concern seems justified. Since 2010, Germany has increased the share of renewables in electricity demand by annually 3.1% on average. If this growth path continued, the country would reach more than 60% renewables by 2025. With the new proposal, however, the government wants to ensure that renewables growth does not exceed its 2025 target of 40% to 45%. Anna Leidtreiter of the World Future Council expects these changes will fundamentally threaten Germany`s leadership position within energy and climate politics, but also lead to significant job losses and reduce business opportunities for entrepreneurs. The switch from feed-in tariffs to auctions would weaken investment opportunities for small investors, energy cooperatives, farmers and enterprises, she says. 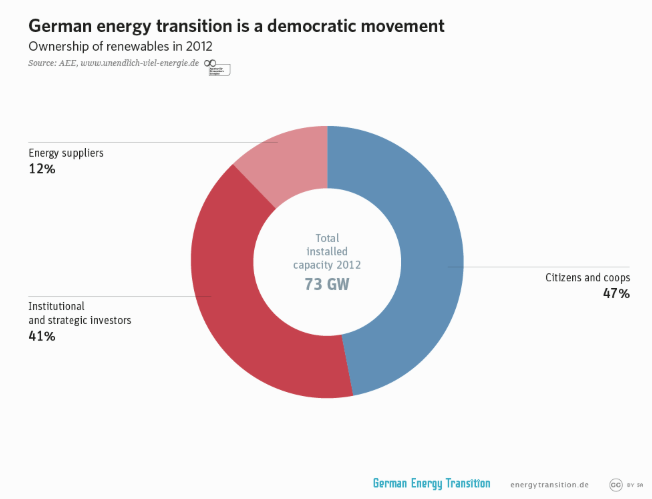 “Citizens are essentially the backbone of the energy transition in Germany. Energy cooperatives alone have invested about 1.3 billion euros (9.5 billion yuan) in RE projects, thus generating revenues for communities, regions and citizens,” Leidtreiter argues. Indeed, the Energiewende has democratised Germany’s power sector in the last few decades. Due to its inclusive design, the policy has enabled new stakeholders to enter the market. They have leveraged significant private investment over the past decade. More than 800 energy cooperatives as well as private investors, farmers, banks and enterprises owned almost 90% of total installed renewables capacity at the end of 2012. In contrast, traditional utilities and energy suppliers invested very little and thus lost market shares. Up to now, the Renewable Energy Act has been a tremendous success story. As the International Renewable Energy Association (IRENA) says, Germany has shown the world that such a high level of renewables can be integrated without systemic problems, thanks to strong grid infrastructure and cross-border exchange links. But the Energiewende as we know it is at a crossroads. So far citizens, communities and new investors have been the biggest drivers for the energy transition. If the caps and the switch from feed-in tariffs to auctions are implemented, large corporations will dominate the market. The reform would exclude many potential investors, including citizens, whose billions of euros would be welcomed to finance the transformation to a low-carbon economy. A recent analysis by the Climate Policy Initiative (CPI) concludes that more than 30 billion euros a year could be available for investment in the expansion of renewable energy capacity in Germany as long as the country shifts policy effectively to deal with the next phase of the energy transition and keeps investment open. These concerns are being discussed in Berlin. For international observers, it is important that broad sections of the country know that ownership matters in the energy sector. The law is expected to be passed before the summer recess by the Bundestag (lower house) and the Bundesrat (upper house). It will be the government’s final major piece of energy legislation before the federal elections in 2017. The Energiewende will move forward. Whether or not the reform puts Germany on track to cut greenhouse gas emissions by 40% by 2020 in comparison to 1990 remains to be seen. Either way, slowing down renewables growth to protect old coal plants is not what the world expects from a global climate leader. Germany’s next government will have to address the challenge of a coal phase-out and how to expand the Energiewende to the heat and transport sector. Arne Jungjohann is an energy analyst and the author of Energy Democracy: Germany’s Energiewende to Renewables.